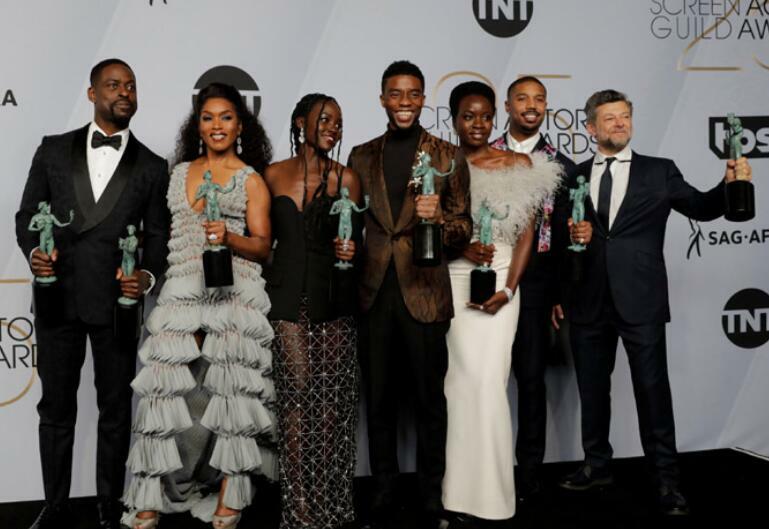 The superhero mega-hit "Black Panther" won for outstanding performance by an ensemble in a motion picture at Sunday night's Screen Actors Guild Awards. The actors were shut out of any individual nominations, but that didn't seem to matter when the cast, led by star Chadwick Boseman, took to the stage to accept the event's top prize. Touching on the cultural impact of the film, starring a black cast, Boseman delivered a powerful speech that included a reference to Nina Simone's legendary song, "To Be Young, Gifted and Black." "We know what it's like to be told there's not a screen for you to be featured on, a stage for you to be featured on. We know what it's like to be the tail, but not the head," Boseman said. "We know what it's like to be beneath, but not above. And that is what we went to work with every day." "Because we knew not that we would be around during awards season or that it would make a billion dollars, but we knew that we had something special that we wanted to give the world," he added. "That we could be full human beings in the roles that we were playing. That we could create a world that exemplified a world that we wanted to see." But it was what Boseman said at the close of his speech that has fans most excited. "I know you can't have a 'Black Panther' now without a '2' on it," he said. Backstage after their win, some members of the cast talked about a follow to "Black Panther." "I think it's a movie that stands against all film across the board," Michael B. Jordan said. "So yeah, I think if there was an opportunity [for a sequel], I think everybody would be pretty excited to come back around." Actor Sterling K. Brown noted that "Black Panther" director Ryan Coogler is already on board. "[Coogler] doesn't lose, you know what I'm saying," Brown said. "Bruh is three-for-three, he's gonna be four-for-four. Brown also shouted out the Marvel team and its head, Kevin Feige. "Feige, he's a beast, man," Brown said. "He ain't going to slip. 'Godfather II.' Like, be ready."